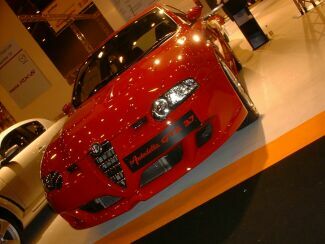 Yesterday evening London design and tuning house Autodelta unveiled their latest creation, the potent 328bhp 3.7-litre Autodelta Alfa Romeo 147GTA, in front of the press and invited guests at the MPH03 Motor Show in Earl’s Court. 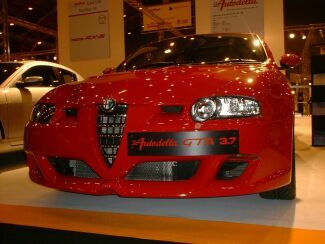 This stunning car with its purposeful, aggressive looks, drew a stream of admirers all evening and the Autodelta team, who have worked hard all year to create the ultimate Alfa 147GTA were delighted with the initial reaction. MPH03, which kicked off at Earl’s Court in central London yesterday is a performance orientated show and the new Autodelta offering looks firmly at home among an array of powerful sportscars which include the Ferrari Enzo, 575M, 360 Modena and the Pagani Zonda C12S from Italy, as well as offerings from Lotus, TVR, BMW, Bentley, Aston Martin and Porsche among others. 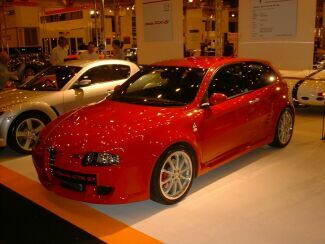 The ultimate ‘hot hatch’, with a breathtaking 175mph top speed, the Autodelta Alfa Romeo 147GTA is destined to become one of the stars of the show. 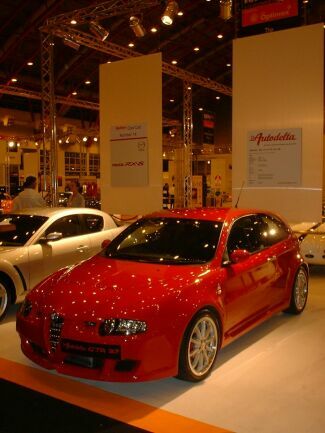 London based Autodelta have taken the standard Alfa Romeo 147GTA, itself much praised, and pushed the boundaries back as far as possible, as only they know how. As soon as one thinks of Autodelta, one has visions of engineers shoehorning the very last cubic centimetre out of Alfa power units in an effort to raise power ‘to the max’, and true to form, Alfa’s gorgeous 3.2-litre V6 is increased to a mind boggling 3750cc. New re-profiled steel billet camshafts, a Ferrari-derived throttle and a completely re-mapped management system see power output raised from 250bhp to 328bhp. Jano Djelalian, the Autodelta boss and driving force behind the project, is clearly very happy with the initial reaction. 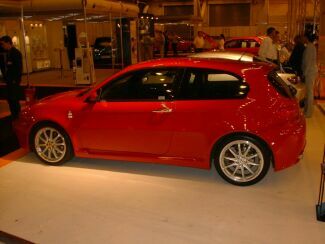 “Almost as soon as Alfa launched the 147GTA our customers were ringing up to see what we could do to it! By last Christmas we decided to go the whole way to create the ultimate 147 and early this year the project was well underway. The first 3.7-litre V6 hit our test rig by the summer and as soon as the new power plant was installed in a 156 test car we knew we were onto a winner. Parallel to the engine development, our design studio was drawing up a styling makeover while extensive thought went into improving the chassis and handling to cope with the additional power”. Autodelta was formed in the mid eighties and has gained a worldwide reputation for squeezing performance out of Alfa Romeos. 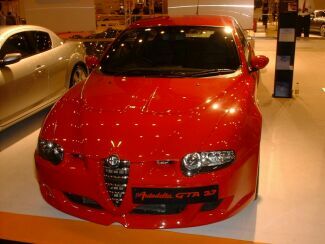 First the old 12-valve 2.5-litre in the GTV6 coupe was raised to three litres and then when Alfa introduced the 3.0-litre 75 saloon, Autodelta pushed it to 3.3. Likewise when the 12-valve was replaced with the 24-valve in the 164 executive saloon, they soon had a 24-valve 3.3-litre version. When the 250bhp 3.2-litre V6 arrived in the 156GTA and Sportwagon GTA, Autodelta responded by raised its capacity to 3.5-litres, and with their new car they have jumped a further step ahead pushing capacity further to 3750cc. To handle 328bhp through the front wheels the chassis has been substantially modified. The addition of a limited slip diferrential, uprated bushes, height-adjustable dampers and new coils springs, together with revised suspension geometry aim to create optimum handling and traction. Jano is a true Alfa Romeo enthusiast, driven by a passion to maximise the potential of the Italian stable’s cars and push the engineering boundaries further than anyone else. “We are driven on by our customer’s requirements, they want a special car, we want them to be fulfilled. With our skilled and focused team we can initiate a project and carry it to production without being sidetracked by compromising issues”. Autodelta are legendary for their work in refining Alfa Romeo’s last sportscar, the SZ of the early 1990’s, and the slab-sided love-it-or-hate-it cars are always omni-present in their modern purpose-built workshops. We talk of the future and Alfa Romeo’s current plan to get back to their roots and create serious sportscars again. You can tell Jano’s itching to get his hands on these future creations: bigger engines with more power and four wheel drive, equates more challenges and more of the Autodelta magic.